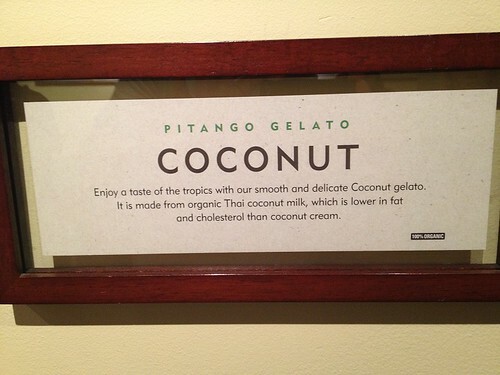 Pitango Gelato | Eat It, Damn It! After the Orioles game, MG and I wanted some ice cream. Most of the shops at the Baltimore Inner Harbor close around 10pm. 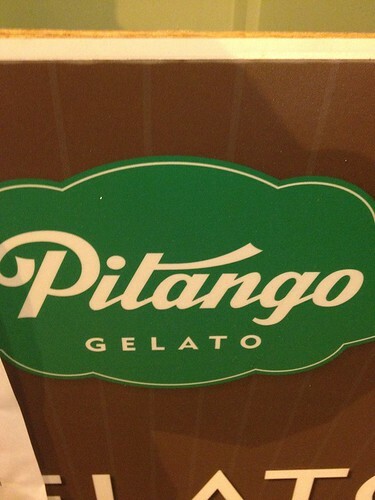 There was one spot that was open a little later (until 11pm) nearby, Pitango Gelato. To get there from Camden Yards is a little bit of a hike on foot, but very quick by car. Late at night, there is plenty of parking. There are also a number of bars in the immediate area if you want a postgame drink. Rather than a chalkboard with flavors scratched onto the surface, there are framed plaques with each flavor. According to a mural on the wall, everything from Pitango is organic. I opted for the Coconut. This gelato is a little pricey with a regular at $4.99 and large at $6.99. The flavor is wonderful, but the texture is a little odd. 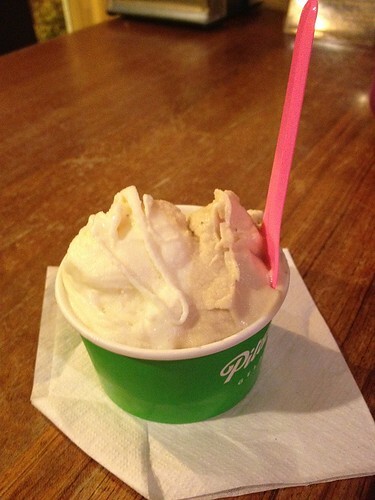 I don’t eat much gelato, and I’m not sure if this is normal, but the gelato seems to stretch almost like bubble gum. MG got a mix of two flavors in a regular (no extra charge). She combined Black Tea and Coconut. The black tea is really nice, almost like eating a sweet tea drink. 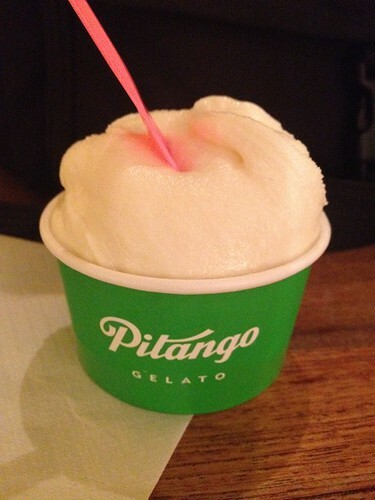 I can’t say that Pitango Gelato is a destination spot, but it is definitely worth a visit if you are nearby and are in the mood for something sweet. The place is frequented by hipsters, or at least it was when I was there, so consider yourself forewarned.